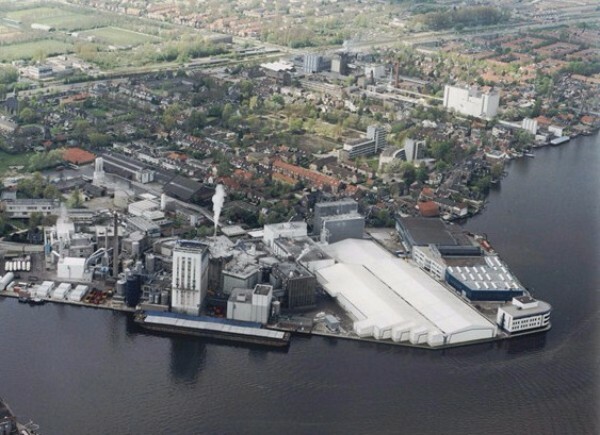 In 2017 Tate & Lyle celebrates the 150 year anniversary of its Koog aan de Zaan (“Koog”) production facility in the Netherlands. Based in one of Europe’s oldest industrial areas, with non-GMO corn supplied by barge. Koog, Netherlands, Monday 19 June 2017 – This year, Tate & Lyle PLC (“Tate & Lyle”), a leading global provider of speciality food ingredients and solutions, celebrates the 150 year anniversary of its Koog aan de Zaan (“Koog”) production facility in the Netherlands. The Koog facility, which began starch production in 1867, produces speciality food ingredients for customers all over the world, in particular in the Europe, Middle East, Africa and Asia Pacific regions. It also produces various starches for the paper and board industries. Located on the River Zaan, approximately 11km northwest of Amsterdam, the facility receives delivery of non-GMO corn by barge. It operates 24 hours a day, 365 days a year, and spans an area of 25 acres, the equivalent of almost 19 football fields. Koog initially processed wheat, but in 1875 the facility was converted to corn processing. In the 1950s hydrocyclones were installed at the facility which allowed for the move from manual to mechanised production. This was fundamental in revolutionising the global starch production industry. Koog has been expanded over the years and received numerous investments to establish new product lines. In 2010 Tate & Lyle commissioned a new STA-LITE® Polydextrose line, the first and only of its kind in Europe. STA-LITE® Polydextrose, a soluble fibre, is a premium, low-calorie bulking agent used to provide body and texture in reduced-calorie, no-added-sugar foods or beverages and / or fibre to a broad range of products including cereals, drinking yoghurt/fermented beverages and biscuits. PROMITOR® Soluble Fibre, a transparent premium fiber, has been produced at the facility since 2012 and is used in products such as energy and snack bars. In 2014 the facility began production of CLARIA® Functional Clean-Label Starches. Then, in 2016 it started production of MULTIVANTAGE® Syrup, a low sugar, low viscosity sweetener that can be used to reduce sugar content while maintaining calorie levels in applications such as breakfast foods. Find out more about our Koog aan de Zaan plant.